Higher education in Canada is an asset. Canada has become an ideal destination for prospective higher education students. According to Times’ Higher Education’s World University Rankings 2018, 26 Canadian educational institutions are among the world’s best. With six Canadian universities among the world’s 200 best colleges, Canada provides multiple opportunities for top-notch education. Canadian colleges and universities are often compared with their US counterparts. Both countries offer high-quality education and have leading positions in the global rankings. Yet, in contrast to the United States, higher education in Canada is cheaper, there is less red tape, and it provides more opportunities for permanent residence (unlike the United States). Canada’s two top universities are the University of Toronto (No. 22 on the list) and the University of British Columbia (No. 34). These two schools are widely known for the research impact, and they produce high-quality academic work that has a profound impact on the world. Toronto is one of the most populated cities of Canada. It’s an eco-friendly green city. It is located at the shore of Lake Ontario, which is one of the five largest lakes of US and Canada. Due to the lake, Toronto has a very mild climate. An hour’s drive from the city, you will find small lakes and forests with a lot of wildlife. An hour and a half drive from Toronto will get you to Niagara Falls and the US border. In Niagara Falls, Canadians have built an entertainment center – a miniature form of Las Vegas. The city of Toronto and the province of Ontario are rightfully considered the most multi-national and multi-cultural place in the country. It has become home for representatives of almost all of the world’s civilizations, including Asians, Italians, Ukrainians, Portuguese, Russians, Indians, Scandinavians and many more. This is a very good thing for the foreign students because the foreigners are treated really well in the city, where each second resident was born abroad. Ontario is the biggest employment market in the country, where it’s not too hard to find a well-paying job. Toronto is city with high concentration of the main financial corporations, industrial enterprises, businesses and advertising agencies. It is no surprise that Google has chosen Toronto for its futuristic mini-city project. Ontario is home to two out of Top 5 Canadian higher education establishments – the University of Toronto and McMaster University. The University of Toronto boasts more than 700 undergraduate degrees and 200 postgraduate degrees. The university is one of the world’s best for medicine and is credited with a groundbreaking discovery of insulin back in 1921. 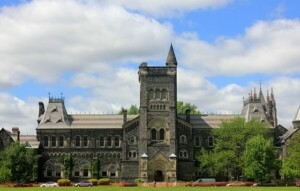 University of Toronto is the flagship of Canadian higher education. McMaster University, located in Hamilton, Ontario, welcomes students and faculty from 90 countries of the world. The university has signed around 70 international academic exchange agreements with universities from all over the world. The university puts strong emphasis on practical research and has achieved some remarkable results in stem cell and cancer treatment. York University offers a wide variety of programs, from Visual Arts to Space Engineering, and is especially famous for its IT programs. Another famous IT education center is the University of Waterloo. Graduates from the University of Waterloo have no problems finding jobs in the world’s largest IT corporations: Google, Amazon, Facebook etc. In addition to excellent universities, Ontario is home to 24 state-of-the-art public colleges, including Seneca College of Applied Arts and Technology, George Brown College of Applied Arts and Technology, Centennial College of Applied Arts and Technology, Humber College Institute of Technology and Advanced Learning, Sheridan College Institute of Technology and Advanced Learning, Conestoga College Institute of Technology and Advanced Learning. The above public colleges have excellent equipment, infrastructure and teaching staff, and they make good competitors for universities. In addition to these public colleges, Ontario also has over 400 private career colleges. University of British Columbia is the oldest university in the province and is No. 2 in the list of Top-5 Canadian universities. The university is associated with 7 Nobel prizewinners, 69 Rhodes scholars and 65 Olympic medalists. Half of the University’s 50,000 full-time students are international students. The University of British Columbia hosts the world’s largest cyclotron (particle accelerator) as part of TRIUMF Canada’s Particle Accelerator Centre, Canada’s premiere physics laboratory. In addition to UBC, British Columbia is home to 10 other public universities, 12 public colleges, 4 institutes and multiple private colleges. The Province of Quebec is home to two of Canada’s Top 5 universities – McGill University and the University of Montreal. McGill University (No. 42 in 2018 World University Ranking) is located in Montreal. In 1829, the country’s first medical school was established in McGill. With over 300 degree subjects offered and 40,000 students from 150 countries, McGill is still widely acclaimed for its strong clinical program. Claiming more Rhodes scholars than any other Canadian university, McGill lists Leonard Cohen and Justin Trudeau among its notable alumni. The University of Montreal (No. 108 in 2018 World University Ranking), the country’s second largest in terms of student numbers, is the only francophone university of the Canadian Top-5. The university has educated multiple public high-ranking officials, and its alumni have contributed to nuclear power, quantum cryptography, visual perception and other areas of scientific research. Getting a higher education in Canada is not only about studying at a high-ranking renowned institution. It’s also a great chance to learn English and French languages, socialize in a diverse and cosmopolitan environment, enjoy safety and security in a country with a high quality of life standards, and pursue research in the land of amazing natural beauty, amid picturesque lakes, blue ponds, and primordial forests. At Jane Katkova & Associates, we can help you enroll in a Canadian higher education institution. Contact Canadian Immigration Experts to help to immigrate for high education in Canada. Learn more about how we can help with your education by visiting our Studying in Canada page.